This bundle will give you one poem-shared reading unit for each month of the year! ACTIVITIES that are all tied together with the same text and graphics! THIS REALLY SETS YOUR LITTLE READERS UP FOR SUCCESS! Each unit will give you a week or two of literacy and shared reading! You can click on each of the units and read more and see a preview if you wish! Why do I love shared reading? You are providing an atmosphere where all readers are successful! You are modeling fluent reading and reading with expression! You are building important early literacy skills by working on letter-sound knowledge, left to right, concepts of print and exposure to high frequency words. You are providing a safe reading experience full of support from you and other readers! Children are able to read and enjoy text that may be too difficult to read on their own. Simple and Fun Fall Colors Shared Reading Poem! Includes color words: orange, red, brown, gray, black and yellow. 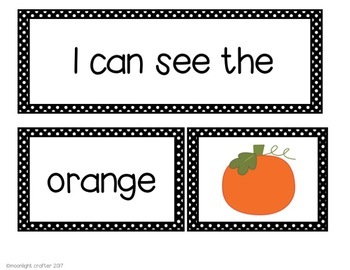 Includes sight words: I, can, see, and the. Colors in the Fall Pocket Chart Cards: includes two options for color words! Fall is in the air...and this is the perfect Fall poem to add to your shared reading activities! pumpkin, house, tree, dog, car, street, etc. There are little "rebus" pictures included in the poem printable! Follow up with the EMERGENT READER! It has the exact same text as the poem printable! 13 Pages of predictable text with great picture support!!! Children will stamp leaves on each page of the book so that the "leaves" are on each of the fall things in the poem!! They LOVE this, and revisiting the text through play-creativity makes it so fun that they forget they are reading!!! Use for group reading, sequencing activities and sight word practice!! Have fun counting and reading with the Five Little Turkeys poem this November! ALL OF THESE MATERIALS ARE CENTERED AROUND A POEM ABOUT GINGERBREAD! THE EMERGENT READER, POCKET CHART CARDS, PRINTABLES AND ACTIVITIES ARE ALL TIED TOGETHER WITH THE SAME TEXT AND GRAPHICS! THIS REALLY SETS YOUR LITTLE READER UP FOR SUCCESS! Pocket Chart Materials: 9 Poem Cards for Reading, Sequencing, and Literacy Activities and 4 Picture Cards that match the poem page. Week Long lesson plan centered around the poems. The preview shows every single page...so you can see if it fits the needs of your students! Loads of literacy activities, letter recognition, beginning sounds, sequencing, high frequency words with a Gingerbread Theme! 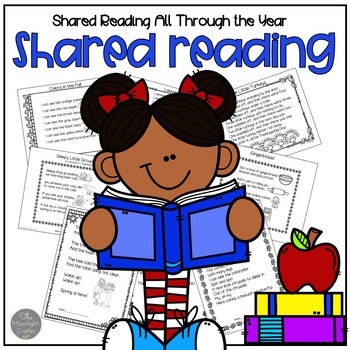 A week long shared reading bundle with sample lesson plans included. I love throwing this in with some Penguin Read Alouds!!! Tacky the Penguin, The Emperor's Egg, Where is Home Little Pip?, Penguin and Pinecone, just to name a few of my favorites! Please follow my store for new products and freebies! ALL OF THESE MATERIALS ARE CENTERED AROUND A POEM ABOUT PENGUINS! Antarctica Task Cards to go along with the placemat. I Have Who Has? Card Game and Directions for Whole Group or Small Group and-or Partner Play! Shared Reading Materials for ONE WEEK! Groundhog themed poem, literacy activities for small group and large groups, pocket chart materials, emergent reader and more! 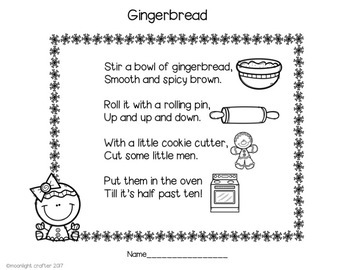 All of the activities and printables have the same text. **these cards are color coded by each line in the poem....for super helpful for organization and when you have more than one child working on this activity! Pocket Chart Materials: Poem Cards for Reading, Sequencing, and Literacy Activities and Picture Cards that match the poem page. **this is a great literacy center or follow up activity after you have done some whole group work on the poem. This shared reading set is centered around the poem Spring! **these cards are color coded by each line in the poem...there are little graphics on each card as well. Super helpful for organization and when you have more than one child working on this activity! **I have included suggestions and ideas for setting this up as a whole group activity as well as a learning center or small group activity! 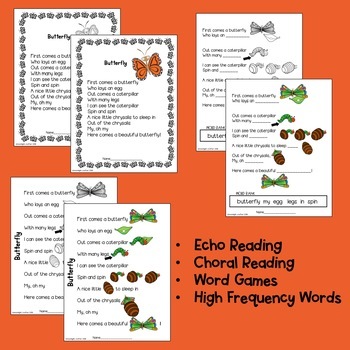 This shared reading set is centered around the poem Beautiful Butterfly!